This was a deeply, deeply disappointing performance by Ireland. For Wales, river deep, mountain high. Minutes after the final whistle blew the cameras caught a glimpse of Alun Wyn Jones, his arms out-stretched catching droplets of moisture from the sky and his eyes averted to the heavens. This was no 'thank you' to the almighty, this was an acknowledgement that Wales managed to garner their Grand Slam without a worthwhile examination. There is no point in picking through the carcass and looking at the micro issues. The gap between the two teams was crystallised on Wednesday. Weather, I feel, is a macro issue and Wales quite possibly were always going to win this game, but my God don't make it easy for them. Joe Schmidt's side do not play catch-up rugby. It is rare that they head into the dressing rooms at half-time far behind. The game plan is simple - attack and get the scoreboard going from early on. More often than not we have seen Schmidt's sides hang on to their lead in the final quarter, confident that their systems will see them through. This was a fundamental error of judgement by Schmidt; bloody-mindedness and awkwardness are one thing but ceding advantage to a team that have something tangible to chase was an enormous mistake. Conventional wisdom told us that over the course of this championship Wales didn't create much, they didn't score many tries, but they were difficult to break down and hard to score against and they were very comfortable in their own skin doing practically nothing. There was evidence of this as the final whistle blew. Wales had run 110 metres with the ball all day. All they had to do was tackle and wait for the mistakes to come, and when Ireland tried to respond, not only did their skills break down under extraordinary pressure, they broke down because they could not play football in dreadful conditions. Neither team had completed an 80-minute performance in this championship and on that basis Ireland would have moments, if not quarters, of ascendancy. They needed to be able to score in those moments, or at the very least keep the scoreboard ticking over. The mistakes they made were down to the fact that they had a complete lack of purchase in this game, and the sullen demeanour that has haunted them throughout this championship reappeared at the moment when they needed to kick into gear. 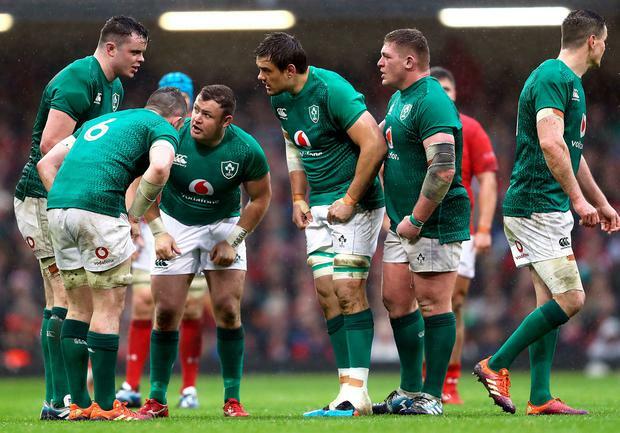 It was questionable whether Ireland ever had the appetite for the contest but when you keep on making mistakes and you cannot play your way into positions of advantage, that is when the creeping doubt manifests. With Ireland's resolve broken and the team heading in to the dressing rooms 16-0 down, what price a closed roof? Ireland were never going to chase this game down, and the controlled emotion that Wales displayed in shutting Ireland out just made the whole thing more difficult to watch. Wales did not just play on the line, they played way past the line. They were wonderfully illegal at maul time, they gave away several penalties at nearly every ruck, and for a team whose scrum was under pressure they managed to get four penalties in this area. I can't blame Angus Gardner for his performance because it scarcely mattered that most times Ireland got something going it was a canny or slightly illegal Welsh play that stopped it. The only constant in this championship was that our wingers always looked dangerous, and to starve them of any ball seemed ludicrous. You would wonder what Jacob Stockdale could have done if he had got six or seven balls into his hands on the front foot on a dry day. All the ball he received was by accident or by chance and yet he looked dangerous. Our friends in the southern hemisphere will look on in a state of puzzlement. How can you win something without actually creating anything? I don't think the Welsh will care. The English have been by far the most creative and imaginative side in the competition and it is they who will go to the World Cup in the autumn as the northern hemisphere's standard bearers. As for some of Ireland's heroes, this match marks a watershed. We might not see some of yesterday's participants in a green jersey again. I'm always relieved when someone is delivering a eulogy and I realise I'm listening to it. Sean O'Brien had the most listless performance of his illustrious career in a green shirt. Normally the type of player who can operate in all conditions, there was no sense of frustration when he was called ashore, just relief. Our half-backs need to go and reinvent themselves at their provinces and in the Heineken Cup, an arena where I think they might thrive. The candles have been burning low in Joe Schmidt's cathedral recently: there have been no voluminous canons of play, no invention, no surprises, no continuity, no wit or dazzle and quite often when his teams win, all of his players play well. The reverse, though, is true and it is hard to reconcile - quite apart from the handicap Schmidt imposed upon his players - how it is and why it is they all played so badly. As for Warren Gatland, he has exceeded what he thought he could possibly achieve when he started coaching. His ability to get it right on the day when it really matters has been his forte. He walks off with three Grand Slams in his pocket. This one, though, on a day when Ireland could not force Wales to play. Could Ireland beat Wales at the Aviva in two weeks' time with nothing to play for? Of course they would, but this rubber stamps the notion that international rugby is about doing it when it really matters. The knock-on from this humbling experience is that Ireland have not demonstrated that they know how to beat Wales in an important match. There is the possibility that Ireland could play Wales in the second semi-final in Yokohama at the end of October, but then given Ireland's decline - and there is now no question that Ireland have regressed - there is no certainty that they could beat the Springboks, even if they take care of business against Scotland. Australia will note that Wales, while difficult to beat and defensively replete with the Shaun Edwards tattoo on their game-plan without the ball, do not create anything, and that might be their downfall. Ireland have not become a bad team overnight, but they have become a mediocre team over the space of three months and will need to address that decline. They will have to take up a mental fall-back position and try and reimagine what it was like back in November and exorcise the creeping doubt which has afflicted their last five performances. As for Wales, well done to them. Three Grand Slams in 11 years is a fantastic achievement, driven on by the redoubtable Gatland whose legacy is intact after yet another clutch performance at the moment of asking. Aided and abetted by the metereologically incompetent.